﻿Last year when our school psychologist and I started looking at ways to help families within our community, we tried looking at putting together events that everyone could benefit from. We wanted to make sure that no one felt singled out, looked at, or ostracized because they needed a little extra help and support. 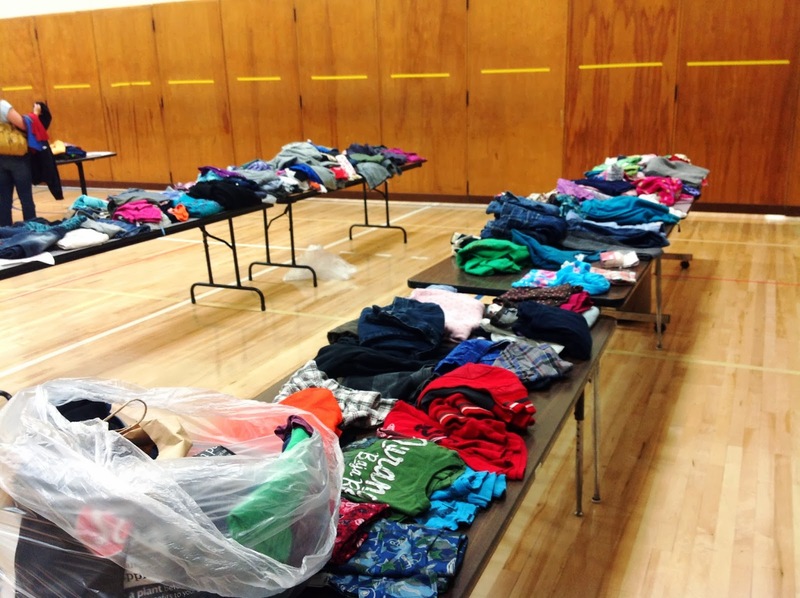 With the popularity of thrift stores, consignment shops, and yard sales in our area, I think it was pretty natural that the idea of holding a clothing swap was born. Kids can grow out of clothes really fast. I know my own son grew several sizes in just a few short months. Clothing can be pretty expensive if you need to replace entire wardrobes several times per year. Not to mention, do you realize how much used clothing ends up in landfills each year? The amount of waste is ridiculous. To be able to swap clothing with another family just makes sense. Here are a few pictures of what the transformed gym looked like. We held our event during Open House so we had a fantastic turnout of kids and parents. Last year when we first tried this idea, we had only a handful of families, this time, it was continuously busy throughout the evening. If you want to try this at your school, my best advise is to piggyback it with another high turnout event, like Open House. Publicize--early and often. Send out reminders, use an electronic signboard if your school has one, send flyers home with every student. 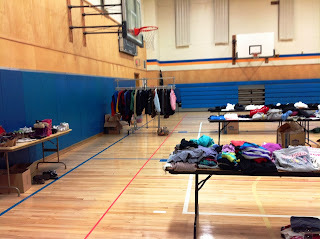 Start early-we really need 5 weeks to gather enough donations to have a great selection for people to browse. 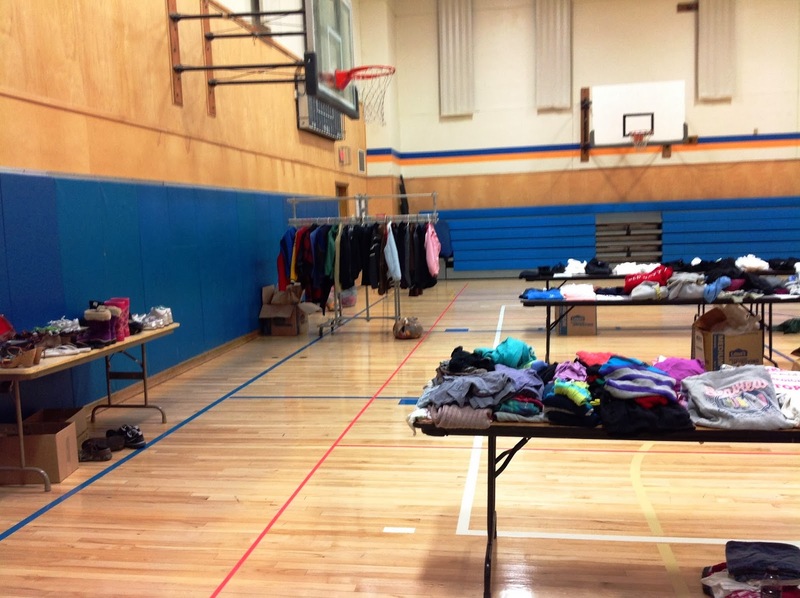 Get lots of help--you will need to sort and organize ahead of time, as well as lay clothing on tables during your event. I was actually surprised by how long this took. Have bags available. Save your grocery bags for people to take things home in, have huge garbage bags available for after the event to bag things up. 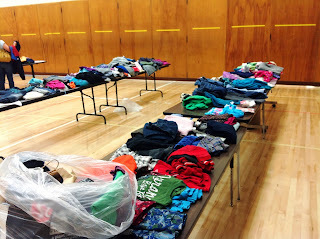 Even though we got rid of a lot of clothing, we still had many large bags left over. You will also need a plan of how to dispose of these items. 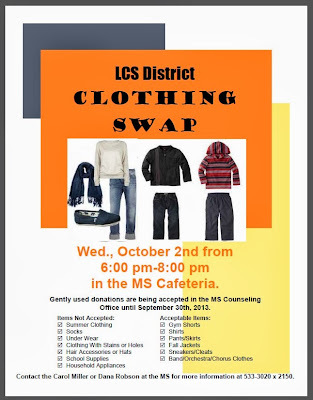 We are lucky because our Student Council has a clothing drop off shed where donations go to another charity organization. Our extra items went to the "shed". Make it fun. We invited all who walked by to come in and shop. We became personal shoppers for kids, helping to find the perfect shirt or pants.